Quality Nikon lens that for sure, it has nice out focus background and pretty sharp even at wide open.Very well built quality lens after 30-40 years just works as swiss watch. I have an A'id version so no problem on DSLR body at all, everything works perfect. So easy to catch the right focus, very good performer indeed.It has warm color rendering what is very nice I found a bit less contrasty than others like Takumar, CZJ SONNAR etc.Very good choice for general purpose short telephoto lens. It’s a pretty decent lens, under rated I think. I've owned both the 135/3.5 Nikkor-Q and Q*C. I’ve shot night shoots on TX with the 135/3.5 Nikkor-Q.C and found it was extremely sharp. My first test was a five minute exposure on a cold, still night. The complete absence of vibrations really shows what a lens will do. I recently used the 135/3.5 Nikkor Q for some protraits and was impressed. The lens is very sharp and the bokeh is nice too. You have to be careful if you are shooting toward the sun because of flare. I also have the 135/3.5 AI. It handles flare situations better. needs it ? 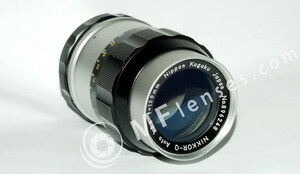 If you have the chance to get it for a Nikon F or F2 - buy it.